In every yoga class that I teach I emphasize the importance of breath to my students. “Disease cannot live where there is oxygen,” I always attest as I encourage students to flood the body with fresh oxygen in full yogic breaths. But we all know how to breathe. It’s innate, right? True, we are born with the ability to breathe, but how to breathe fully, completely is something that most Westerners forget how to do. Shallow breathing that is commonplace from stress and fast-paced lives poses a serious threat to health. Yoga in itself is beneficial because the physical movement creates oxygenation. 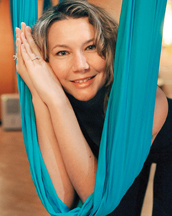 Many styles of yoga, including Kripalu-based and VaihAyasa Aerial Yoga, are breath-based practices, that not only teach you how to breath properly, but that also offer techniques to more fully permeate the body with fresh oxygen. The significance of oxygen to health is not a new discovery. In 1931 Dr. Otto Heinrich Warburg received the Nobel Prize for proving that cancer cells cannot live in the presence of oxygen. The cancer cell is the “arch criminal” of cancer. It is a common cell, nothing very special until it begins to change from lack of oxygen. Dr. Warburg showed that the “cause of cancer is the replacement of the respiration of oxygen in the normal body cells by a fermentation of sugar”. In medical science, the critical role of oxygen has been shown. Oxygen nourishes cells, creates energy, combats fatigue, breaks down waste products and toxins, provides energy needed to metabolize carbohydrates, regulates body chemistry PH balance, creates immune system defense and fights off invading hostile organisms. The importance of breathing properly cannot be stressed enough. Whether fatigue, irratibility, immune deficiency, or if you are just looking to maintain health, increasing oxygen in your body should be a high priority. Learning to breathe to full capacity, along with regular physical movement provided by yoga classes, whether they be vigorous or gentle, will help to counteract, balance, harmonize and help protect the human body from disease. It may also help to alleviate various existing diseases and health challenges. Coupled with phsyical movement, the breath-based classes offered at Kaya Wellness & Yoga in Rehoboth Beach, DE and at Kaya Aerial Yoga in Philadelphia teach students how to breathe properly, fully, so that you can maintain health and increase your energy with simple techniques. At first, breathing properly will take work and dedication, along with patience, but over time breathing to full capacity will become a natural state of breath, influencing your health positively without effort. There are many schools of yoga that offer an interconnection of breath to postures, and philosophy. It is important to find a studio and teacher that resonates with you. So, do your research and find a place where you can focus your mind, deepen your practice, and soak in the vital benefits of a breath-based practice. Kaya is excited to announce that it will be moving to its new location at 43A Rehoboth Avenue in downtown Rehoboth Beach, DE. We closed our current location December 30th, and will remain closed through April in order to prepare our new location. We will re-open our Rehoboth Beach studio in its new location at 43A Rehoboth Avenue, in May 2014. In the meantime, private pranayama (breath) classes & yoga classes are available at your location. For more information, please contact the studio at 302-227-3450 or email info@kayawellnesscenter.com.